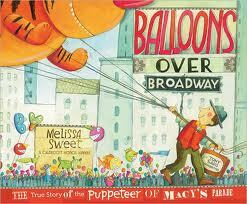 Balloons Over Broadway is the latest creation from Caldecott Honor winner, (and we are proud to say a Maine resident) Melissa Sweet. Using her signature collage illustrations colored with vibrant pastels, one feels immediately drawn to this episodic explanation of how Anthony "Tony" Frederick Sarg's contribution to the Macy's Day Parade made it a annual holiday event. Who was Tony Sarg? (his name rhymes with aargh) He was a master puppeteer who, along with his staff, was responsible for creating the puppets that make the Macy’s Day Parade so thrilling. The book’s momentum is exciting. Keep in mind this book is not a biography of Tony Sarg. Rather, it is a brief history of how the Macy’s Day Parade came to be. I found it interesting that the initial reason for having the parade was for the people working at Macy’s. Sweet relays just how creative and persistent Sarg was in his pursuit to create the best, most entertaining puppets for the parade so that everybody could see them. "What if the controls were below and the puppet could rise up?" This book is really beautiful and deserves a place on every library shelf. Sweet explains that to create the art in this book she began by making toys and puppets, some of which you can see throughout the book. She wanted to convey a sense of having fun. Sarg's "legacy reminds me that 'play' may be the most important element in making art." 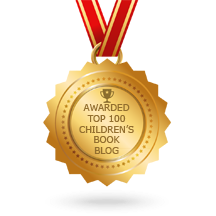 Balloons Over Broadway has received starred reviews from a variety of professional journals that is well-deserved. Sweet is a versatile and extremely talented artist. The combination of text and illustrations is perfect. The book is full of energy and the smiling faces of the crowds and puppets with the bright colors begs frequent readings. 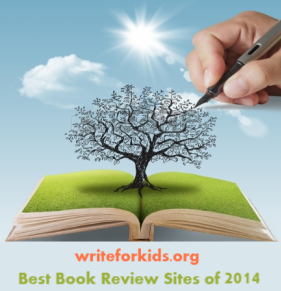 Children of all ages, and adults as well, will find much to enjoy. NOTE: A cool fact found in the author's note states that Tony could not have accomplished all he did without his talented apprentices. "Bill Baird later created the puppets for "The Lonely Goatherd" marionette show featured in the movie The Sound of Music. (And one of Baird's apprentices was Jim Henson, who invented the Muppets.)" NOTE: Though this in no way diminishes the quality of the book, it is a shame some of the historical detail, such as the discrepancy of Sarg’s year of birth and what was his country of origin wasn't clarified within the text or in an author’s note. This looks like such a great NYC book. The parade certainly is an institution and I look forward to it every year. I love books like this and will be looking for it. Thanks for this fine review. I really liked this as well, but I agree with your final note. Why not have some mention of Sarg's country of origin? The author made it a point to mention that he was a non-American... it seems logical that she could then have mentioned where he was from. Or does it really matter? thanks for this review - just in time for the parade!